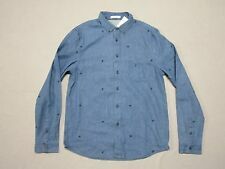 CHAMBRAY BUTTON-UP. INDIGO PEACH. Indigo colored button-up shirt. Color: Indigo. Gray tortoise shell colored buttons. Full button closure down front. 100% Cotton. Blue stitched details & accents. Excellent - Only slight signs of wear. Does not diminish the overall appearance of the item. FABRIC: Cotton. Good - Shows signs of regular use. Item shows visible wear. COLOR: blue. SIZE : large. Up for Auction a Alternative Apparel Men’s Pink, Grey Stripped Polo Shirt Medium. Excellent Used Condition!! Please see Pictures. Shirttail hemline. Chilly weather calls for basic attire. Laid-back shirt is crafted from a yarn-dyed flannel to keep you warm. Hidden button-up front closure. L - Armpit to armpit 22.5", Shoulders 19", Sleeves 27", Length 30". Alternative Apparel Mens Polo Shirt Medium Gray. Condition is Pre-owned. Shipped with USPS Priority Mail. Size Type: Regular Sleeve Length: Sleeveless Style: Tank Fit: Regular Material: Polyester. Size Type: Regular Sleeve Length: Long Sleeve Style: Button-Front Fit: Regular Material: Polyester. Alternative Apparel Button Henley. Alternative Earth Eco Series. One Button Neck With Notched Collar. Heathered Black Color. We only list pictures of the ACTUAL item for sale. What you see is exactly what you get. Shoulder to Hem: 29 ". Armpit-Armpit: 19 1/4". Alternative, Polo Rugby, Gray, 2XL, Solid, Casual, 100% Pima Cotton, Short Sleeve, Button Front, Collar, 30" Total Length X 24" Chest Across, Single Chest Pocket, $89.00, New without tags, Manufacturer tags or packaging defaced or not included. Alternative, Polo Rugby, Gray, 2XL, Solid, Casual, 100% Pima Cotton, Short Sleeve, Button Front, Collar, 30" Total Length X 24" Chest Across, Single Chest Pocket, $89.00, New with defects, SK-005DBU-002. Good condition, minor wear ( refer to pictures ), cotton blend, striped, crewneck. LIKE NEW 2. Excellent/great 3. God bless! 3 small holes! Two in the bottom, front right and back right. One in the left armpit. Scoop neck - Sleeveless - Chest patch pocket - Colorblock detail throughout - Approx. 29" length (size M) - Imported. Machine wash cold. Fiber Content.